The Innovative Teaching and Learning (ITL) Research Team, Australia is happy to announce the release of the ITL Australia Phase II Report (pdf 2318 kb) developed by our research team at SORTI, University of Newcastle in collaboration with Microsoft Australia, Stanford Research Inc (SRI) and the NSW DEC. The report provides an overview of the study methods, use of ICT by teachers and students, and provides examples of innovative educational activity from across the state. The supports and impediments for this innovation are explored in terms of systemic and school-based vision, and the impact of leadership, instructional methods and school context. The importance of individual teacher dimensions is illuminated through interview analysis and task exposition. This report includes exemplar case studies and learning activities and a copy of the Phase One Report. The site visits reported here are from five of the 22 NSW public schools that constituted the entirety of the Australian sample. We also interviewed a selection of government leaders to profile the policy environment in the system at the time of the study. We believe there are some key messages about current capacity, policy directions and opportunities that will be of interest to educators. The Innovative teaching & Learning Australia team is based at SORTI, The University of Newcastle. We are part of a multi-year global research program on Innovative Teaching and Learning (ITL) practices designed to investigate the factors that promote the transformation of teaching in the 21st century and the impact of students' learning outcomes across a broad range of disciplines. The Australian partners are the Department of Education and Communities (DEC) and Microsoft Australia. Education and political leaders in countries around the world have recognized the imperative to prepare their youth for the 21st century, a goal that many believe requires the fundamental transformation of educational opportunities together with the integration of technology into teaching and learning. But educational change is complex. It takes place within an ecosystem of influences that range from national policies, programs, and supports to local community contexts and school-specific professional cultures. The project helps develop a deeper understanding of Innovative Teaching and Learning (ITL) practices, which can provide students with transformative educational opportunities in schools through the integration of technology across a range of disciplines. There are 24 schools involved in the ITL Australia project. If you are interested and not yet involved, schools can access free tools to help them measure their own innovative teaching practices at http://www.pilsr.com/. Teams are available to conduct professional development sessions on ITL in schools and are able to provide a more detailed approach to innovative practice. 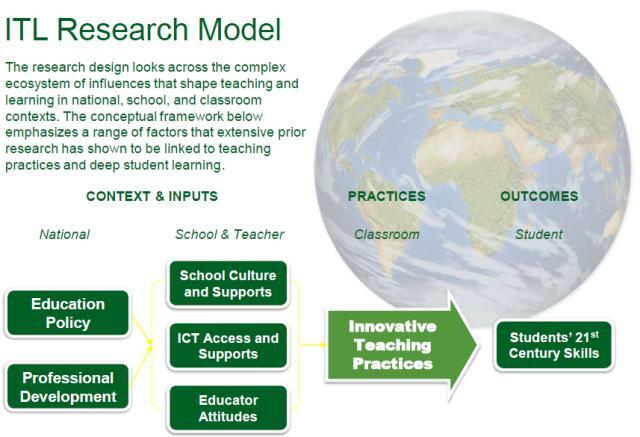 In addition, the ITL Australia research project takes a hands-on approach to investigating innovative teaching and learning practices through introducing the different dimensions of 21st century skills involved in developing effective learning activities for students both in school and for homework projects. Participation in Professional Development workshops are designed to provide an opportunity for teachers to analyse Learning Activities and Student Work using these dimensions. There is an emphasis on the middle years of schooling, in the disciplines of Humanities and the Sciences.